The DC3 was originally designed in America in1935 by the Douglas Aircraft Company for a long range passenger aircraft for American Airlines. It was first flown in December 1935 and could carry ~20 passengers at ~300km/h for ~1600km or ~1000miles. The military version of DC3 is officially called C-47 Skytrain (US Army Air Force), or Dakota (RAF, RAAF, RCAF), and was also nicknamed Gooney Bird. The DC3 was used extensively during WW11 by the Allies for supplies and parachuting troops behind enemy lines. It was extensively used in D-Day operations and could tow troop gliders. Each HARS aircraft has a towing ring in the tail to tow a troop glider. The military version also has double-width cargo doors and strengthened floors and could carry up ~28 paratroops or ~2.5 Tonnes of cargo or ~18 Stretchers. Production of the DC3 finished 1949, with a total production of ~16,000 including some built in Japan (~480) and Russia (~4,900). The RAAF used 124 Dakotas. In commercial guise ANA/Ansett ANA operated 70, East-West Airlines operated 7, QANTAS operated 20 (owning 8), and TAA operated 23 DC3s. The DC3 is a very strong rugged aircraft. There is a famous quote that says: “The only aircraft that can replace a DC3 is another DC3”. There are still more than 300 flying examples worldwide. The HARS aircraft were both built during WW11 in Oklahoma City in early1945. Both were delivered to US Army Air Force on the same day, 20th April, 1945. They are #76774 and #76764. They were delivered to the RAAF as A65-94 and A65-95 in May, 1945. Both aircraft were flown by the RAAF in New Guinea and the South West Pacific theatre during WW11. But on 9 May 1963 A65-94 was part of C flight, 2SQN based at RAAF Butterworth, opposite Penang Island, Malaysia. She flew the first operational mission of the Vietnam War, delivering food and medical supplies to refugees fleeing the fighting. 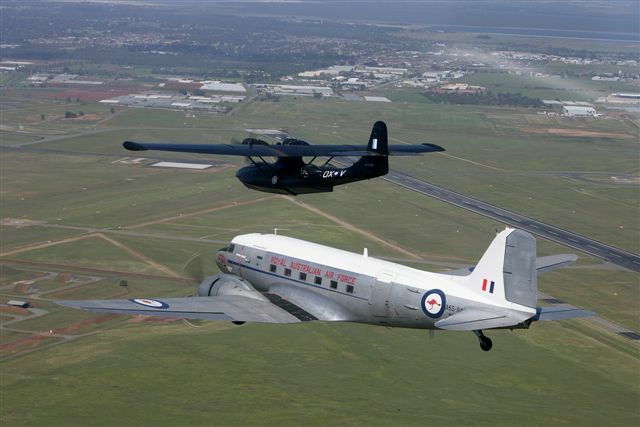 Both aircraft served with many different RAAF Squadrons, and at times were used for VIP transport, air crew training and pilot currency, general transport duties, and weapons trials at Aircraft Research Development Unit (ARDU). Both aircraft were decommissioned from the RAAF in 2000 at 55 years of age with ~14,600 and ~14,900 flights hours respectively.